By the late 500s AD, the Visigoths were the only people in Europe who hadn’t converted from Arianism to Catholicism. They were beginning to feel a little old-fashioned. Then a strong, successful king of Spain, Leovigild, married his oldest son, Hermengild, to a Frankish princess, Ingundis. Ingundis was only ten or eleven years old when she got married about 578 AD, but because she had grown up in France she was definitely one hundred percent Catholic. When Ingundis got to Spain she was twelve years old. Her mother-in-law demanded that she convert to Arianism, and when Ingundis refused, her mother-in-law beat her, according to the story, until she was covered in blood, and then had her stripped naked and thrown into the baptismal pool as if she were being baptised an Arian. Still Ingundis remained Catholic. Soon afterwards, Ingundis and Hermenegild left the court and went further south, where they led a rebellion against King Leovigild. There were a lot of Catholics in the south who supported Hermenegild. By 582, when Ingundis was fifteen, Hermenegild also converted to Catholicism. By 584, though, Hermenegild’s rebellion had lost to Leovigild’s larger army. 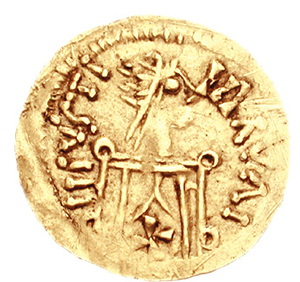 Ingundis fled to Byzantine Spain with her baby son Athanagild, and Leovigild killed Hermenegild in 585. 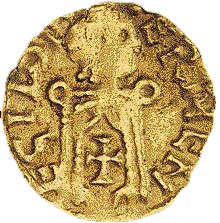 But Leovigild himself died the next year, and his second son, Reccared became king – and soon announced that everyone should convert to Catholicism. So that was the end of the last Arian kingdom anywhere in Europe. Ingundis and Athanagild began the trip to Constantinople, but Ingundis died in Carthage on the way, possibly of plague. Athanagild made it to Constantinople, where the Emperor Maurice raised him. Five years later, Athanagild’s grandmother Brunhilde tried to get him back, but nobody knows what came of that: maybe Athanagild died of plague too; maybe he was killed with Maurice’s family in 602. Cite this page: Carr, K.E. Who was Ingundis? Visigothic Spain. Quatr.us Study Guides, August 2, 2017. Web. April 21, 2019.